Hollywood’s Golden Age costume designer Edith Head comes alive. 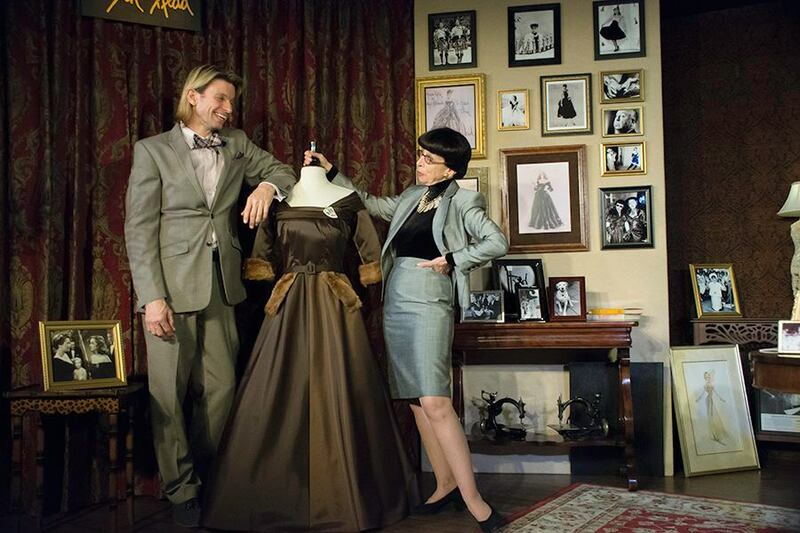 Very alive, thanks to Susan Claassen, who is appearing with Austin Cabaret Theatre (http://www.austincabaret.org) on Tuesday, May 19 and Wednesday, May 20, 2015 for her tour de force, “A Conversation With Edith Head” that is a whirlwind of talent. When I caught up with her by phone from her Tucson residence, the star is a bundle of energy. How could she not be to keep up the breakneck pace needed to mount such a performance? It turns out that the play is truly a smart vehicle. Confides Claassen, “Over 85 percent of the play is in Edith Head’s own words.” It turns out the actress spent hundreds of hours pouring over Head’s papers, calendars, diaries and mementos at the Margaret Herrick Library at the Academy of Motion Picture Arts & Sciences Library in Los Angeles to research the role. She wanted to get it right… and she does. The project was first developed years ago when, as Claassen freely admits, she discovered her own likeness to that of Head’s was uncanny and the rest, as they say, is show business history. Then The New York Times came calling. Mountains of press ensued and the packed-house capacity of the show remains a staple on the theatre circuit. The fact that Head is still relevant is an understatement. “She was a remarkable woman and it is a gift to portray her. Listen, you don’t appear on a postage stamp, have an animation and become a Google Doodle (on Head’s birthday) without a lifetime of work to which Edith Head devoted herself,” she states. That star power of Head that Claassen brings so vividly to life yielded 35 Oscar nominations (the Oscars didn’t recognize costume design as a category until well into the golden era of Hollywood, 1949), and Head won eight. Doing the math on that, she was nominated almost every year from her mid-career years onward. In addition to Grace Kelly, Head dressed a Who’s Who in the pantheon of classic stars including Audrey Hepburn, Doris Day, Loretta Young, Kim Novak, Natalie Wood, Elizabeth Taylor, and a plethora more. Her secret to dressing an array of faces and figures and making them feel magical? Head herself is famous for saying, "I always wear beige, black or white. For one thing I look good in them. For another, when I'm beside a star at a fitting and she looks into the mirror, I don't want to be competing in any other way." About personal style, Claassen adheres to Edith Head’s own dictum to “find your own style, Honey, and stick to it.” The inimitable fashion savvy of Head and Claassen both stick together like needle and thread, so run, don’t walk to see it in person at Austin Cabaret Theatre (http://www.austincabaret.org) on Tuesday, May 19 and Wednesday, May 20, 2015.